Twitter: #journorequest and #prrequest | One year, one job. In The Basics II, I mentioned hashtags and how they can be overused and lose any impact they were ever intended to have. This is so often the case, but there are two hashtags in particular that are great for journalists. 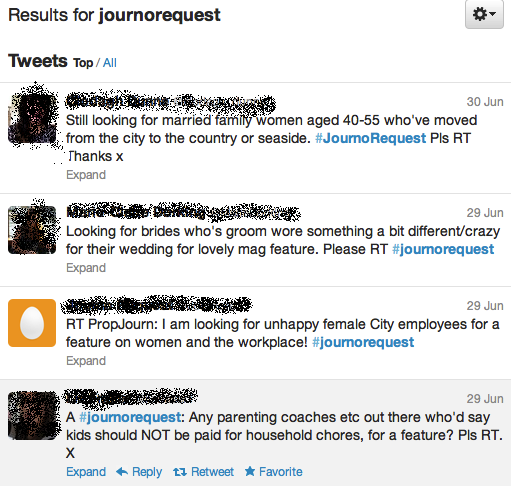 Both #journorequest and #prrequest allow for Journalists and PRs to interact with each other productively. The former seems much more active and it’s main usage is by journalists looking for case studies or products for articles that they’re writing. The hashtag was originally started by @SarahEwing and certainly seems to have taken off with at least a hundred tweets being sent with the hashtag daily. So how can you get involved with the hashtag? Well, firstly it highlights a lot of features writers on Twitter who might be worth a follow. And secondly, you might be able to help out a journalist – maybe you are the case study that they’ve been searching for. Sometimes they’ll be money on offer for case studies, other times it’ll just be a great opportunity to learn about being part of a story. I once replied to a request from a Masters student looking for case studies for her dissertation to have their social media profiles analysed by professionals. In return for simply sending her links to my profiles, I got some really great feedback about my online presence and how to improve it to make me look more professional. Most of the time the hashtags are just used for the aforementioned reason of finding case studies, or by PRs pitching new products, but there are occasionally other surprise uses for it too. The other day I genuinely saw a job advertised with the hashtag being used to attract the right crowd. I follow both these hashtags on Tweetdeck but they’re easy to look at on the web platform of Twitter too. Simply search #journorequest and then select ‘all’ to see what everyone is looking for. Do the same for #prrequest and you’re all set. You never know, you might even be able to use it to find the perfect case studies for a feature you’re pitching. This was originally posted on my old media blog.